The number of major contracts awarded across the global oil and gas industry declined during the last quarter, according to the latest quarterly report from the UK-based Energy Industries Council (EIC). 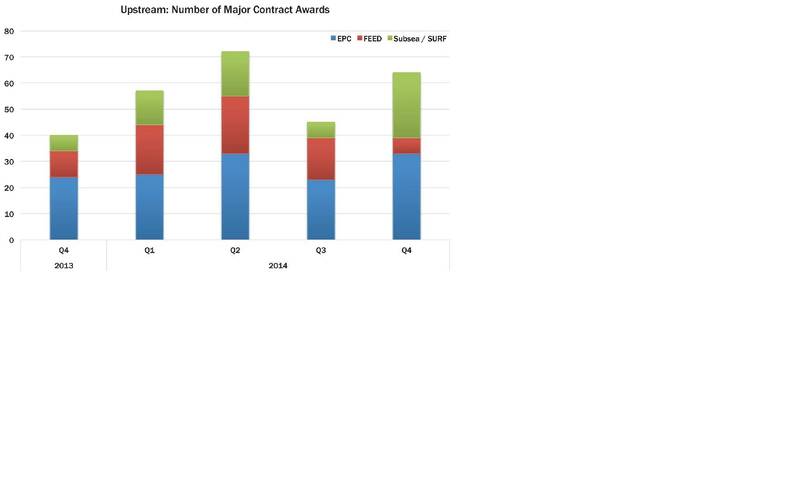 There were 117 major contract awarded between October and December 2014, the report said, a 22% decrease compared to 150 in the third quarter of 2014, but on par with the 118 contracts awarded in the fourth quarter of 2014. Data was sourced from the EICDataStream online project database, which tracks nearly 10,000 projects proposed or under development in the global energy industry. In spite of a general slowdown, upstream contracts, including Engineering, Procurement & Construction, Front End Engineering Design, and Subsea/SURF contracts, fared well in the fourth quarter, rising 42% over the third quarter. The EIC predicted fewer awards in the coming year due to lower oil prices. The next EIC quarterly report will be released in April.